This is the last weekend to go deer hunting in Wisconsin, and it's been a fairly good year there for the sport. Hunting has been on the decline in most of the country for at least a decade - it now competes with other less grueling weekend activities. The decline is causing problems: fewer hunting licenses sold means less money for state wildlife departments. But the Wisconsin Department of Natural Resources says that demand has increased this year. The economy's got everyone worried, and a deer or two can provide a lot of family meals. It's something Sarah Lemanczyk knows well. I'm standing in the kitchen of my parents' house. It's 5 a.m., it's 12 degrees, and I'm about to go on my first deer hunt - with my dad's best friend and hunting buddy, Bob Sweet. I always thought that my first hunt would have been with my dad. But for a variety of reasons, it didn't work out that way. Hunting was a way of life in my family for generations. My great- grandfather came from Poland to work in the logging industry and never made quite enough to make ends meet. So the family survived by shooting squirrels, trapping rabbits and Auntie Kasha's goose-blood soup. My dad, Dennis Lemanczyk, was the first Lemanczyk to graduate from high school. His friend Bob Sweet was a kindred spirit. "Back when I was a young man, I lived in a small town," explains Bob. "Everybody went deer hunting. There was almost a stigma if you didn't go deer hunting." Bob Sweet and my dad both moved to the city - Madison - but they never adjusted. That's why they felt right at home beheading and skinning deer in our suburban front yard. "My fingers felt like they were ice cubes on the ends of stumps during that process, getting that skin off," he says. The now headless and skinless carcass was then brought to me so I could pick the gristle off it before it was officially slaughtered, labeled "chuck" or "steak" and tucked away in the basement freezer. 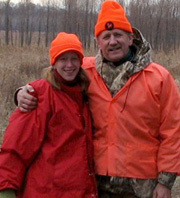 Each year I begged my dad to take me hunting. Each year he said I had to be 13. By the time I reached that age, I was going to the mall. I was listening to glam rock on my Walkman. I was busy. My dad was diagnosed with colon cancer my junior year of high school. He died when I was 18. Now, at 36, I am just a few years shy of the age he was when he died. And when I tell my children who we are, as a family, there's something missing. I'm out to find my dad in the woods with Bob Sweet. As we head out, the crisp, clean echo of gun shots are already in the air. "There are guys who will sit out here all day," explains Bob. "They won't leave their spot from six o'clock in the morning until 4:30 in at night. They'll never leave it. On a good day, I'll stay here about two hours. Then I'll justify leaving and saying this isn't a good spot." We're sitting at the base of a tree, nearly under a deer stand -- but Bob is not a deer stand guy. I could see it being a not-so-good spot in the not too distant future. Icy prairie grass and frozen marshland spreads out ahead of us. I'm wearing two pairs of mittens, and Bob's mustache is starting to freeze over. "What they'll do in that high grass is they'll get out there and lie down," says Bob. "The deer that have been around for more than one year are acutely aware of what those gun shot sounds mean. So they get pretty crafty." I'm floored. "That's wild that they know. I wouldn't have thought that they'd know." "They're very smart. That's another thing too, in trying to track deer - I actually have seen deer standing behind me," says Bob. Then we hear a buck snort. He's close by, so we go on the alert. We don't get the buck. We don't even see him. But the finicky deer gives us the chance to talk about my dad. It's the first time we ever have. One of the last things my dad said to me was not to forget him. He was leaving us so young; it was his greatest fear that we wouldn't remember him. At the time I couldn't imagine a day when his memory wouldn't pierce every moment. "If we'd had this conversation 15 years ago," I say, "there'd be this time and this time and this time. But now it's just kind of this haze. I remember dancing with him at your wedding, him spinning me so fast in the polka that I couldn't stand afterwards." "In a lot of ways," I tell Bob Sweet, "you're the closest touchstone that I have." Bob remembers things, too. "He had the darndest funny little grin when something was funny to him," he tells me. "He didn't do a big belly laugh or anything. He just had this funny little grin. He'd scrinch the sides of his mouth together." I know exactly the grin he was talking about. It's refreshing to think of him that way, and not the way he was at the end. The night he died, I dragged my baby sister there to say goodbye. She was nine. His eyes wouldn't focus anymore, and he couldn't speak. I don't really even know if he knew we were there. It was New Year's Eve, 1990. "You know, when he got sick, it really really bothered me," says Bob. "And I don't know if you're aware of this or not, but I didn't go see him very much after he was sick�I didn't want to acknowledge that he was sick. And it was stupid of me. And I don't know to this day. I can't really tell you what it was. I would have rather taken a beating." I never knew this before. It doesn't hurt, really, but it's all just so sad. For my dad, for Bob, for me. We sit there, his mustache frozen, my hands beyond numb, waiting for deer. But then the deer come. Five of them, flushed out from another hunter's bullets -- just out of our range. We follow them across the frozen marsh, through grass as tall as me and taller. It's beautiful. I can't believe how much I want to find the deer and kill them. This is why you hunt. "Let's loop around and see if we can catch the ladies," says Bob. Even with the gun, Bob and I are far outwitted in this cat & mouse game. Us against them. It's like being out with my dad. "You know, when your dad passed away, I kind of thought, 'Well, I've got a responsibility here,'" says Bob. "Nothing was ever said between us, but I said 'I have a responsibility here.' I have a kinship to you and Becca. There's something there." In the car, Bob Sweet told me there had been a hole in his heart because we'd never spoken about my dad. I hadn't realized there had been one in mine, too. We didn't say much else. We'd been deer hunting and it was almost noon. It was time for the final ritual: The Sportsmans Bar & Grill. It is deer hunting after all. And it is Wisconsin. And we had Packer football to talk about. Powerful words. Makes me pause and reflect on the importance of family and and the simple beauty of nature. Even while hunting, it's a place we can all find peace. Lovely moments in this piece and some fine, sparse writing. Bob's voice is so very dad-like. I'm available if either of you need a third. The reason there are fewer hunters is for the exploding human population . Just ten years ago there were lots of good hunting and great outdoor adventures which are now suburban development with thousands of homes and mile after mile of usless retail center where can buy a subway an ice cream or shop in exspensive gift shop at almost every location. Sometimes I worry about animals adapting to this because because they are running out of places to go just like respectful men and women who hunt and respect the outdoors of nature. I think the world needs to limit the amount of kids one can have or there will be nothing left for them either. It was so touching. Sad, but also it made me feel so happy that Bob could share this memory with you. You know what they say- you can take the girl out of Wisconsin but you can't take wisconsin out of the girl. Go Packers!!! It is a beautiful piece of rememberance. Well done!